Galvanized stay rod, useful to limit the movements of the weighed structure without affecting the weighing results. Fitted with two ball-and-socket joints (overall lenght adjustable from 260 to 350mm). Central mobile lichpin, for the length regulation. 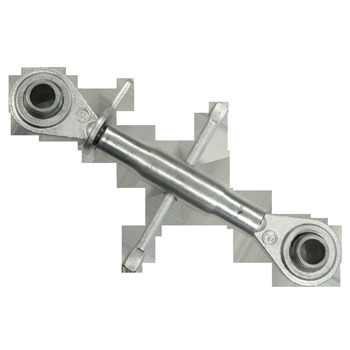 LNK2635 Galvanized stay rod with ball-and-socket joints. Max 100 kN. For proper installation, 2xLNKST are needed. LNKST Single plate for stay rod. Fitted with fixing screw. (For proper installation, LNK2635 and a second LNKST are needed).